Should you provide outpatient infusion when a patient’s usual acute migraine therapy doesn’t work? Most practitioners would agree that not all migraine attacks, even in the same person, are always identical. Some migraines may come on gradually and respond rapidly to early acute therapy. Other attacks may already be full blown if they occur in the early morning, awakening the patient from sleep. If there is associated nausea and vomiting, oral medication may be minimally or totally ineffective. This raises the important issue of what can been done for patients when the medication that is usually effective for them fails, or when they are still disabled by a headache and other migraine-associated symptoms 3 to 4 days after onset. Unfortunately, the case presented is not unusual. Although there is ample evidence that opiates are not the most appropriate emergency treatment for migraine, opiates still seem to be the primary option used when this is where patients present.1-4 This is 1 of the reasons patients with migraine hate going to the emergency department (Box). Effective treatments from a review of available evidence and expert experience are provided in Table 1.5,6 Opioids are less effective, can decrease the effectiveness of other medications, and may contribute to transformation to chronic migraine and development of medication-overuse headaches. In our practice, we have routinely collectively and retrospectively reviewed 3 years of data before and after treatment in our infusion suite, which we presented at the American Headache Society Annual Scientific Meeting in 2016. We use a 4-point (0-3) rating scale for headache pain (as we do in most acute migraine trials) and for nausea, photophobia, and phonophobia. 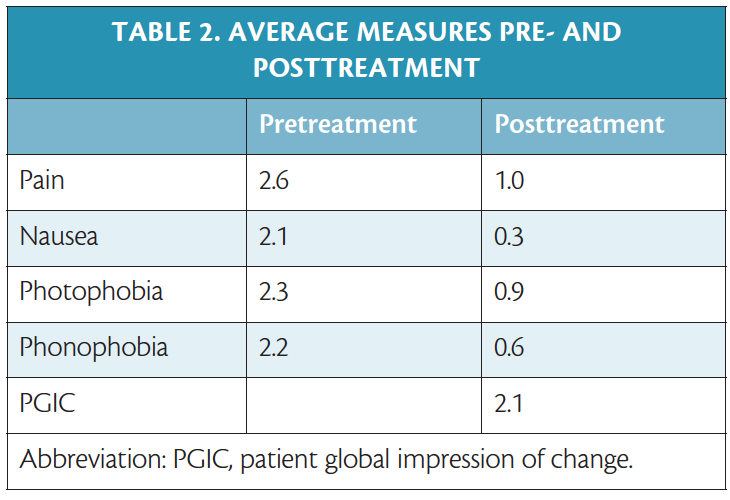 We also ask our patients to complete a Patient Global Impression of Change (PGIC), also a 4-point scale (Table 2). After treatment in our infusion suite, our patents (n = 554) had a reduction in migraine pain severity from an average of 2.6 to 1.0 (Figure). 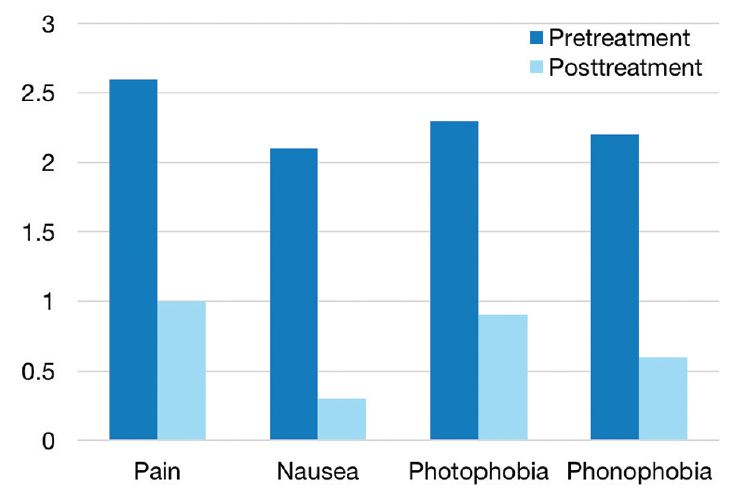 Similar reductions in nausea, photophobia, and phonophobia were also seen. Similarly, patients’ average PGIC scores improved by 2.1 (3.0 maximum improvement) and 526 (95%) of patients felt significantly improved after treatment. Only 28 patients had no improvement (27; 4.9%) or felt worse (1; < 0.1%). 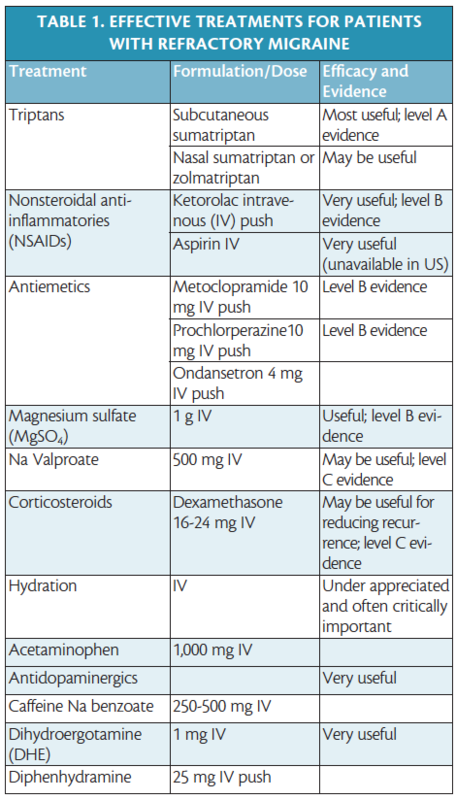 Treatment-emergent adverse events are summarized in Table 3. There were no cases of gastrointestinal bleeding or abdominal pain. Advantages of infusion-suite rescue therapy over emergency department care include: rapid evaluation and treatment, controlled sensory environment (light, sound, and odors), patient comfort (reclining chair), readily available medical records, ability to customize therapy, and lower cost. Disadvantages include rare but unexpected medication reactions for which the practice must be prepared, the need for a well-trained nursing staff, a plan for contacting care providers or ride services if patient ability to drive home is impaired, and the investment of time and money to obtain and stock these medications. It should also be noted that this is not meant for unknown or “walk-in” patients and there is little evidence-base for these treatments. They are predominantly experience based. Infusion-suite treatment may also be limited or even inappropriate in patients with comorbid conditions. For these patients, other options may be considered, including occipital and trigeminal nerve branch blocks. Although the evidence base for these is also limited, most headache specialists find them useful and well tolerated. Sphenopalatine ganglion blocks are straightforward and can also be done in the office. 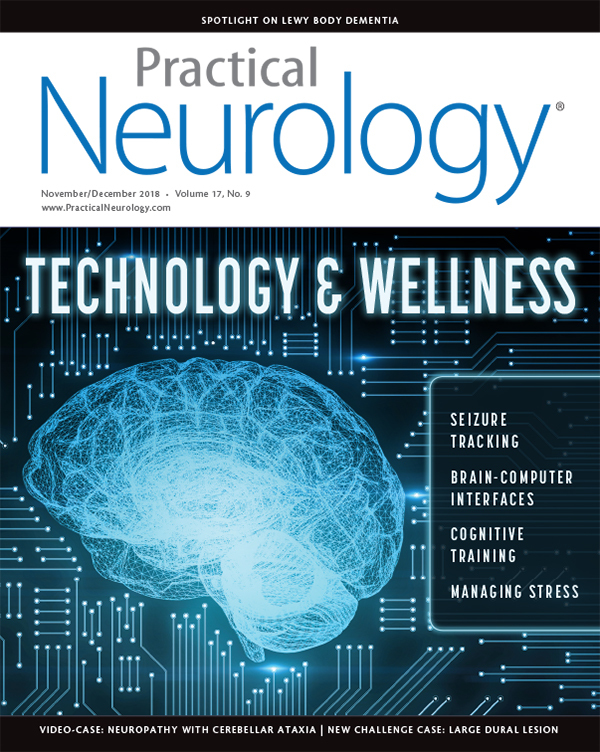 Noninvasive vagal nerve stimulation and noninvasive supraorbital nerve stimulation are also potentially useful treatments that need further evaluation in this context. Transcranial magnetic stimulation may also be useful in selected patients. 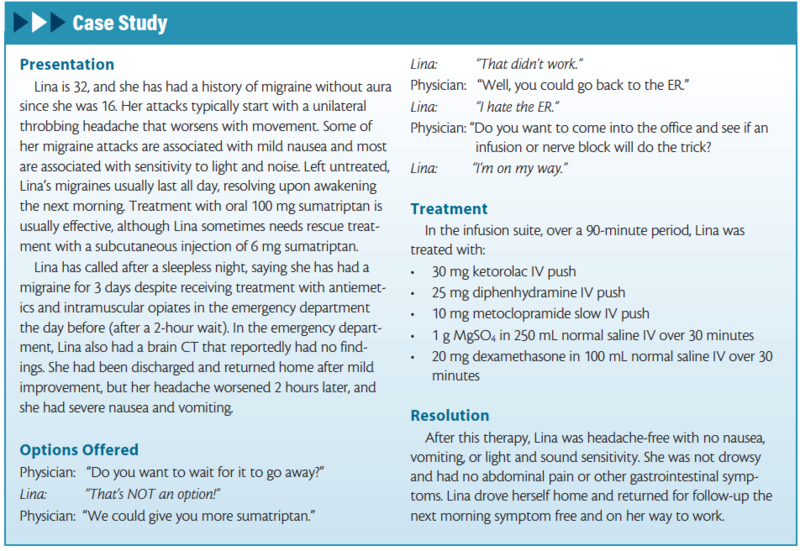 Outpatient infusion-suite therapy for a refractory migraine attack is a realistic option for selected practices that is well accepted by patients with migraine. Avoidance of opioids is essential except in the rare instances when they may be the only option. There are also clear cost savings and increased patient satisfaction compared to emergency department care. 1. Barton C, Evaluation and treatment of headache patients in the emergency department: a survey. Headache. 1994;34:91-94. 2. Sahai-Srivastava S, Desai P, Zheng L. Analysis of headache management in a busy emergency room in the United States. Headache. 2008;48:850-854. 3. Minen M, Tanev K, Friedman B. Evaluation and management of headache in the emergency department: a review. Headache. 2014;54:1131-1145. 4. Friedman B, West J, Vinson D, et al. Current management of migraine in US emergency departments. Cephalalgia. 2014;35:301-309. 5. Gelfand A, Goadsby P. A neurologist’s guide to acute migraine therapy in the emergency room. The Neurohospitalist. 2012;2:51-59. 6. Reisert E, Harding T, Turner I. A 2 year retrospective review: Community-based outpatient infusion center experience in the acute treatment of refractory migraine. Poster: American Headache Society 59th Annual Scientific Meeting. Boston, MA, June 9, 2017.